Well-known Dallas/Fort Worth reporter Rafael McDonnell was on the scene at the Jewish Person of the Year Dinner last week. Rafael filed the following report on the festivities as beloved Shuggie Cohen was named the Jewish Person of the Year. Thanks, Rafael, for doing such a stellar job of reporting. Most of Fort Worth is asleep at three in the morning. But not Alfred “Shuggie” Cohen, the winner of B’nai B’rith’s 2009 Fort Worth Jewish Person of the Year award. His day starts at 3 a.m. with exercise and a three-mile run. Cohen received the award June 6 at a dinner held at Temple Beth-El in Fort Worth. He said it was a surprise to him. “I didn’t expect it, but I really feel honored that they thought of me to make me the person of the year. I didn’t know that it qualified me for this honor. It should have gone to somebody more qualified,” Cohen said. As a greeter and volunteer at Congregation Ahavath Shalom for about two decades, Cohen is a familiar figure and steady presence for scores of people. He’s served as a volunteer at many programs including Jewish Family Services. And at midday, you can find him at as a participant in the seniors’ lunch program. That is, when he’s not on the golf course or running his second three miles of the day. “I’ve been running for over 50 years, three miles every morning and afternoon,” Cohen said. In fact, he estimates he’s run over 50,000 miles in his lifetime. “The only time I wouldn’t run is in the ice,” Cohen added. Cohen’s devotion to service extends to the neighbors he passes on the early morning run. He takes the time to toss their newspapers closer to their front porches. “At four o’clock in the morning I don’t wake anybody up. They think that they have a good newspaperman; what they don’t know is that it’s an old man,” he said with a laugh. Cohen was born in Fort Worth, but as a young man he moved with his family to Wichita Falls. That’s where he met his late wife, Eva Dale Cohen, one day at the soda fountain of a drugstore. Cohen went to work for Zale’s Jewelers, which originated in that city, and stayed with the company for several decades. He later moved to Laredo, and then finally to Fort Worth. At the awards ceremony, Cohen was joined by some of his children, five grandchildren and 12 great-grandchildren. Robert Chicotsky, a member of the committee who chose Cohen as Fort Worth’s Jewish Person of the Year, said Cohen was a logical choice for the award. “We look for Fort Worth community activity, leadership and Jewish community leadership and involvement. [Shuggie] knows everybody, and everybody cares about him,” Chicotsky said. B’nai Brith also awarded three scholarships as part of the evening program to Eric Kuptsin, Ashley Uptegraft and Shani Hoffman. Kuptsin is a 2010 graduate of Paschal High School; Uptegraft graduated from Fort Worth Country Day School; and Hoffman graduated from Aledo High School. The Texas Gypsies performed while guests dined on barbecue. 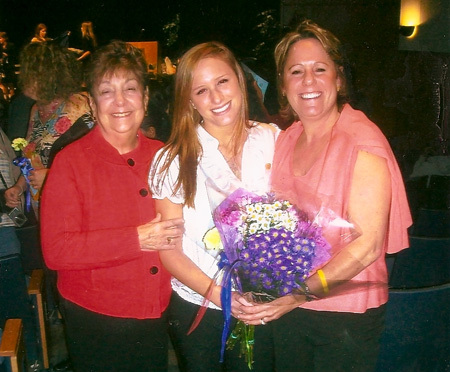 Brittany Ackerman, daughter of Shawn Ackerman and Gayle Biemeret, and granddaughter of Leroy and Rhoda Solomon, was honored and inducted into the National Honor Society at North Crowley High School earlier this year. In addition to her being selected for her scholastic achievement, Brittany has been active in many community projects. She enjoys spending time with her family and friends. “Shepping nachas” with Brittany’s induction into the NHS are her entire family. Her bubby, Rhoda, was also the recipient of the National Honor Society Award during her high school days in New Jersey.